One of our favourite places to visit for my grandchildren and I is the zoo. In Victoria we have three sites under the directorship of Zoos Victoria. Admission to all three sites is free for children during weekends and State school holidays, however, a membership to Zoos Victoria allows free entry every day, 365 days a year. A family membership can make a wonderful gift for Christmas or special occasion. It also means it is economical to visit often and for a particular focus rather than having to spend a whole day overloading senses and experiences. Little and often means that my grandchildren really absorb what they are experiencing and are learning about conservation of flora and fauna while having fun at the same time. The site at Healesville specialises in the conservation of and research into Australian native animals and birds. 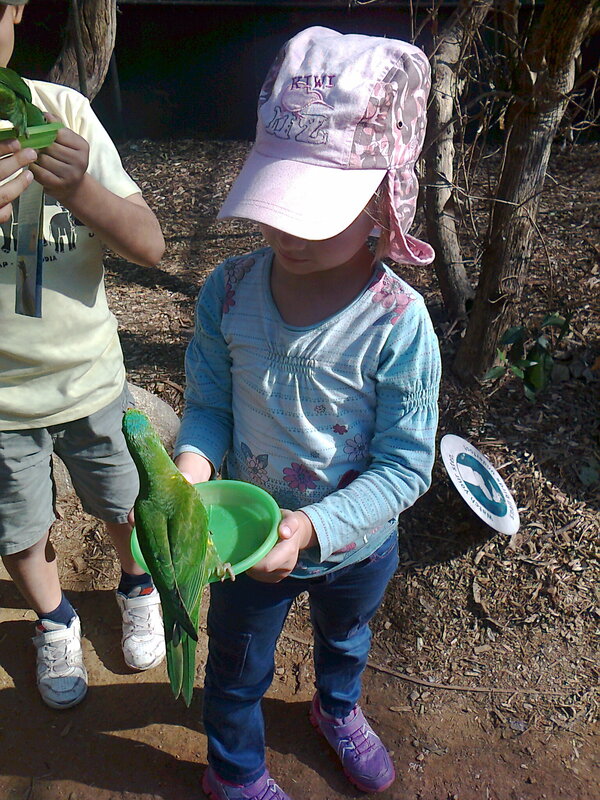 On this particular visit to Healesville my grandchildren and I enjoyed “the World of Parrots” with the children very excited at being able to feed the lorikeets some nectar. Looking for a venue for an outing with young grandchildren? A trip to the zoo is always popular with young children and I have found that a membership of my local zoo is a great investment. If you are lucky enough to live within reasonable commuting distance of a zoo which offers membership benefits I would encourage you to join. Generally, a membership offers unlimited entry and some zoos actually have more than one site. Entry for children under the age of four years is often free which makes it the perfect venue for an economical outing. I often take my grandchildren for a visit to one of our state zoos and each time we focus on only two or three exhibits. This way we have time to talk about the animals and watch them intently. Sometimes we are even lucky enough to encounter a zookeeper who will tell us a story about the animals in an exhibit. Many zoos also have volunteer guides who are a great source of information and stories about the animals in a zoo’s collection. With a snack and a water bottle in my bag we are set for a morning or afternoon visit and home again before any of us is too tired.